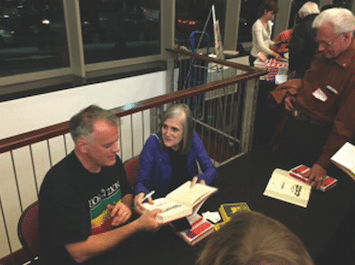 Progressive journalist Amy Goodman took the stage at Rose Wagner April 18 to talk about her sixth and newest book: Democracy Now: Twenty Years of Cover­ing the Movements Changing America. 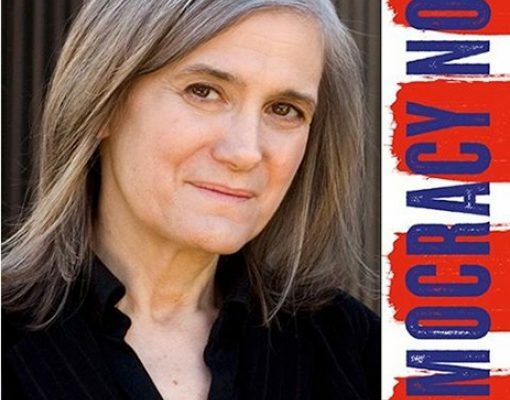 She is the host of Democracy Now!, an independent news program broadcast weekdays on more than 1,400 public TV and radio stations and the Internet around the globe. The diminuitive Goodman, just barely peeking over the wooden podium, remarked on how she couldn’t see the front row, and visa versa. Addressing the 500-person near-capacity crowd in the Jeanné Wag­ner theater, she gave her talk standing beside the podium, sometimes leaning on it for support, microphone in hand. 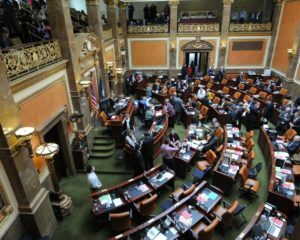 She had good reason to lean: SLC was stop 20 on a 100-city speaking tour during the 2016 election to raise awareness and funds for independent media and to celebrate 20 years of Democracy Now! news hour. 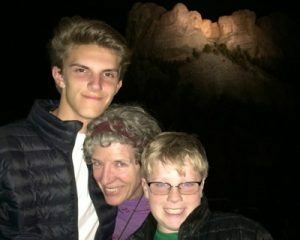 She and her team recorded Tuesday’s show from KUED-TV’s station at 4 a.m., before traveling to Colorado for their next talk later that afternoon. 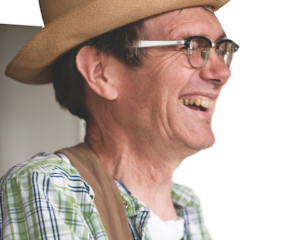 The event was attended by invited guests and KRCL’s Spring radiothon donors of $100 or more. A VIP reception took place before the show where attendees could meet Goodman and bestselling author and syndicated columnist Denis Moynihan, who is also a speaker on the tour. Moynihan is a contributing author of the book, as is Amy Goodman’s brother, independent journalist (Mother Jones, New York Times, Washington Post) and bestselling author David Goodman. The book addresses the powerful move­ments and charismatic leaders who are re-shaping our world. Yet Goodman’s emphasis during the talk, and what clearly fuels her passion for her work, are the stories of the people affected by these movements. “What would change about the conflict in the Middle East if everyone heard from a Palestinian child, and then an Israeli grandmother?” She reiterated the importance of journalists going where the silence is—behind the riot barricades, behind prison bars—and giving voice to those stories that wouldn’t otherwise be heard. “There is a hunger for authentic voices – not the same handful of pundits on the network shows who know so little about so much, explaining the world to us and getting it so wrong.” She found after their first year broadcasting in 1996, after President Clinton was re-elected, that there was an even greater demand for the show, a demand by the people to hold those in power accountable. “There’s a reason why our profession is the only one explicitly protected by the US Constitution: journalists are supposed to be the check and balance on power, not win popularity contests,” she writes in the introduction of the book. A major bonus for fans is revealed as I dive into my copy; as I read, I hear each written word spoken in Amy’s firm, low-pitched and dignified voice that is so recognizable over the airwaves. Her tone calms me and her words fuel me with faith in my field, igniting a fire to stay the course through this strange, financially stressed time for independent media. A book signing followed. You can purchase Democracy Now: Twenty Years of Covering the Movements Changing America (Simon & Schuster, $26) at Weller Book Works, 801-328-2586, or visit samwellers.com.